Hi friends. Finally a break in the temps today. Our Grandkids had no school Tuesday and Wednesday because of the very cold temps, but compared to down South where they had snow and ice and are not used to dealing with it, we were lucky. Spring cannot come soon enough this year! I ordered this darling little Elephant and the gift boxes, which are Magnolia. I could not wait to ink them up and use them when I got them. Little Elephant and gift boxes are by Magnolia. 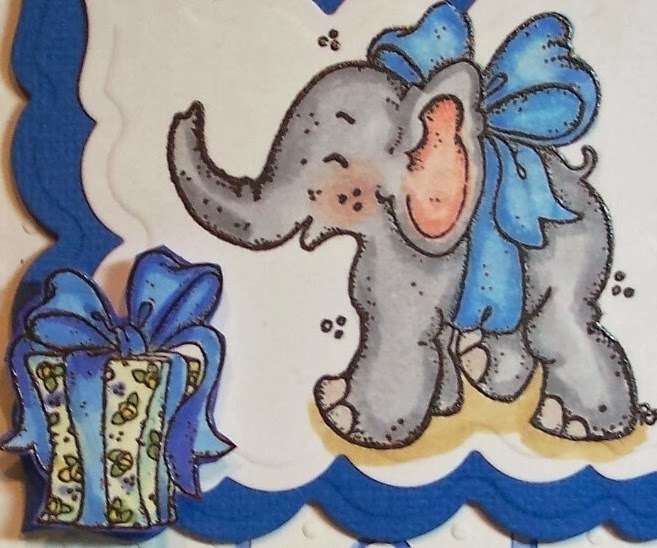 Awwwww such a cute elephant, I love the gift boxes and fabulous colouring. A great layout too, I the punched hearts look so beautiful. o this is so cute and a gorgeous card Sue. Well that is the cutest elephant I've ever seen. Love your packages and hearts. Super sweet card, Sue. Our temps are going up into the high 40's over the weekend. It's crazy around here. WONDERFUL Sue!!! I just love this sweet little elephant...I haven't touched mine yet! Your colouring as always is just so RIGHT...trying to use new adjectives as when I visit you I need to use so many!!! I'm with you on the temps and snow...SPRING WHERE ART THOU??!!! But yes we Northerners are much more prepared for the white stuff!! Such a cute Card! Beautiful coloring on the Elephant. Thanks for joining us at Tildas Town. Good luck! Awww this is so cute Sue, love the image and your colouring. Beautiful design too. Hi Sue! Well you had me with the blue, right off the bat. The little elephant is just adorable. Everything is colored to perfection. so cute! lovely blue & white card with a yellow touch. Thank you for joining us at Tilda's Town this week. 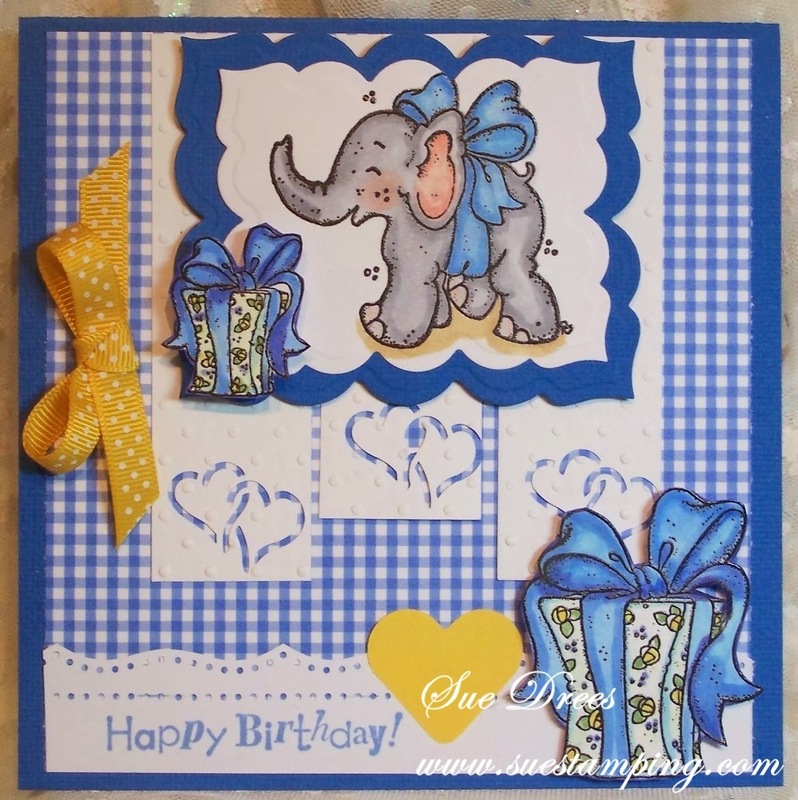 I love the shape of the present box, and the oh so cute elephant,just a delightful card. Love your colouring!